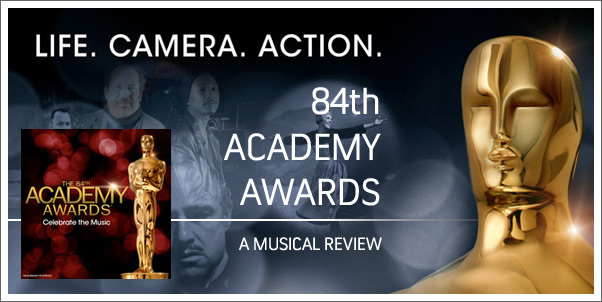 My best guess says I've watched about 25 of the 84 Academy Award ceremonies over the course of my life. I maintain that I continue to find the shows enjoyable simply due to the fact that the Oscars are not as much about Hollywood patting itself on the back as it is a simple celebration of the movies themselves. I’m obliged to one Tom Cruise for repeating a very similar statement just before announcing the winner for Best Picture. (I had no idea that he followed us on twitter!) All and all, I’d have to concede that this year’s Oscar ceremonies wer just about par for the course. There were some good moments, bad moments, and moments of “memefication.” Eh, Ms. Jolie? Aside from Cirque Du Soleil’s short, but mesmerizing performance, another remarkable facet to this year’s show was the fact that composer HANS ZIMMER and PHARRELL WILLIAMS were in charge of the night’s music - giving the ceremonies a decidedly different musical vibe from previous years. To my pleasant surprise, a short digial release of Zimmer and company’s music debuted on iTunes the day after. Right from the onset of the show and this release, HANS ZIMMER and company make it clear that this is not going to be your Papa’s Oscar music. Infusing a sense of expectancy and anticipation with subtle grandeur, well deserving of an Oscar setting, is Zimmer’s title theme, “Celebrate the Oscars” (1). The theme provides the backbone for this 8 track release. While a couple of tracks deviate from the course that this piece sets, by the time you finish listening through the 28 minutes of music, the musical motifs established in this opening track are what will remember most.